Thanksgiving is always a great opportunity to try out new recipes, and this year was no exception. 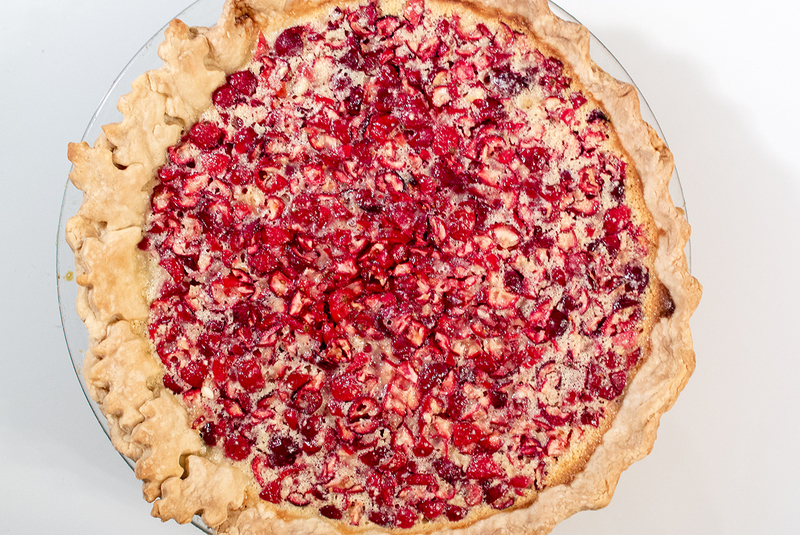 I like the seeming simplicity of this recipe (relatively few ingredients and minimal prep work), plus a cranberry pie is certainly not commonplace, so it gets points for originality. Roll out half of pie dough on lightly floured surface. Lightly beat 1 egg and brush some on the dough, then place the other half of pie dough directly on top. Roll out the double layer of dough into a 12″ round. Ease into a 9″ pie plate. Fold the overhanging dough under itself and style edges as you like. Refrigerate until firm, about 30 minutes. Preheat oven to 350 F. Line crust with foil and fill with beans or rice. Bake until lightly golden around the edge, about 15 minutes. Remove foil and continue baking until bottom of the crust is dry, about 5 more minutes. Transfer to a rack and let cool completely. Meanwhile, make filling: Roughly chop cranberries and combine with ¾ cup sugar and lemon zest in large bowl. Spread in cooled crust. Whisk the remaining 2 eggs, heavy cream, flour and remaining ¼ cup sugar in a bowl until smooth; pour over cranberries. Bake until filling is set and slightly puffed, 50 minutes to 1 hour. Transfer to a rack and let cool completely. Dust with confectioner’s sugar. I’d never had a cranberry pie, so I wasn’t sure what to expect. It turned out very well, in the end. Sweet, but not overly so, with a delicious, substantial crust. Definitely one I’d make again!